Former NBA player Lamar Odom was taken to a Las Vegas hospital Tuesday after he was found unconscious at a brothel in Nevada. The media director at Dennis Hof's Bunny Ranch in Crystal, Nevada called 911 about 3:15 p.m., reporting Lamar was experiencing a "medical emergency" and was unresponsive. The 35-year-old was transported to Desert View Hospital in Pahrump (about 20 miles away). According to the Sheriff's office, Lamar -- who's 6-feet-10-inches tall and around 230 pounds -- couldn't be airlifted to Las Vegas by helicopter because of his stature. Lamar, who has publicly struggled with drug and alcohol problems in the past, is said to be suffering from organ failure and is in a coma. According to the folks over at TMZ, Lamar arrived at the brothel alone Saturday. “Lamar Odom calls me on Saturday wanting to hang out for a few days to ‘have some fun,'" Dennis Hof, who owns the brothel, told CNN. "I have a home attached to the Love Ranch and offered it up to Lamar. He was having a ‘good time’ at the Ranch and everything was great. Again, Sunday everything was good but Lamar was a bit somber because people were calling and bothering him. To my knowledge, there were no drugs involved, Lamar was eating well and was just healthy. At [6 a.m.] Tuesday morning the 'girls' [said] goodbye to him because he seemed to be going to sleep. Around 3:30 p.m. Tuesday afternoon, two girls, Ryder Cherry and Madison, [went] to check up on him and he's unconscious. They immediately call 911 and dispatch tells the girls to roll him over on his left side and [he] starts to puke. He was totally unconscious. The girls and staff [rushed] him out on the ambulance. The police didn't find any illegal drugs on him. [H]e was taking A LOT of herbal Viagra. When they took him to the Pahrump hospital, the people there told us, 'He doesn't look good. He doesn't look like he'll make it and if he does he won't be the same. '” Dennis told another reporter Lamar took “upwards of 10 herbal Viagras." Which, is A LOT! The pills are sold in single-serve packaging at convenience stores with names like “African Superman,” “King of Romance,” “Stiff Nights” or even “Bigger Longer More Time More Sperms.” The FDA has cautioned people from using these supplements because of unknown or unsafe ingredients. In testings by the FDA, one of these over the counter supplements had 31 times the prescription dose of tadalafil, which is Cialis’ active ingredient. Lamar played for the Los Angeles Lakers and the ex-husband of Khloe Kardashian, who filed for divorce in 2013 after four years of marriage, citing irreconcilable differences. 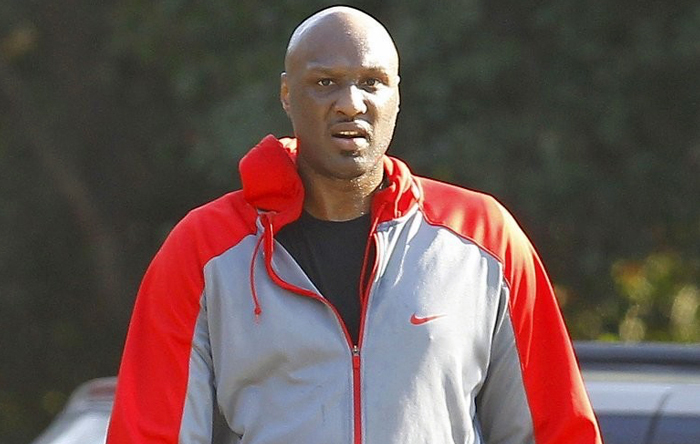 Update: Lamar's estranged father, Joe Odom, believes his son was drugged. “Somebody drugged my son," he said. "There’s no way he’s down there partying crazy like that. No way.” Yea, sure. Update #2: Sources inside the hospital are talking. Once source told E!, Lamar had “virtually every drug imaginable” in his system — and track marks on one arm — when he overdosed and was found unconscious at the brothel. Doctors there believe he suffered an ischemic stroke, which is caused by a drug-induced blood clot blocking blood flow to the brain. “He was doing crack cocaine all weekend and he choked on his mucous,” the source added. “They’re now having to fix all the damage it has done.” Sources told TMZ that fluid in his lungs may have been the result of crack cocaine use. There are reports he's brain-dead. Update #3: Nevada authorities have taken the former NBA player's blood sample to find out if he overdosed on drugs or alcohol, but the results could take several weeks. Nye County Sheriff's Detective Michael Eisenloffel said at a news conference Wednesday that Las Vegas police will be doing the testing. Sheriff Sharon Wehrly says the media director (now identified as Richard Hunter) called 911 on Tuesday to report Lamar was found unresponsive at the legal brothel with blood and a "white stuff" coming from his nose and mouth. Richard told dispatchers Lamar did cocaine Saturday and had taken up to 10 tabs of an over-the-counter sexual performance enhancer -- now identified as Reload 72-hour Strong -- which he purchased at the brothel. Update #5: Dnenis Hof has been making the media rounds, giving an interview to anyone who will listen. Khloe (who is still married to Lamar because their divorce hasn't been finalized) had her PR person send him a letter asking him to stop. His response: “I told her (Khloe's publicist) to pass on a message: Go to hell.” Love it! Update #6, Oct. 16: A family representative said Lamar has regained consciousness and was speaking and even offered a thumbs-up from his hospital bed.